As a chronic renter I’m always reinventing ways to display my favorite things. This jewelry display idea is an easy way to show off your baubles and pretties without adding a million holes to your walls or tangling all of your chains in the process. One trip to the hardware store and you’re in business. Step 1: You’ll need 1 panel of pine measuring 3/4″ x 20″ x 48″, a drill, a pen, primer, spray paint or latex paint in your favorite color, 1/2″ screw hooks for jewelry, 1″ screw hooks for handbags, sand paper. 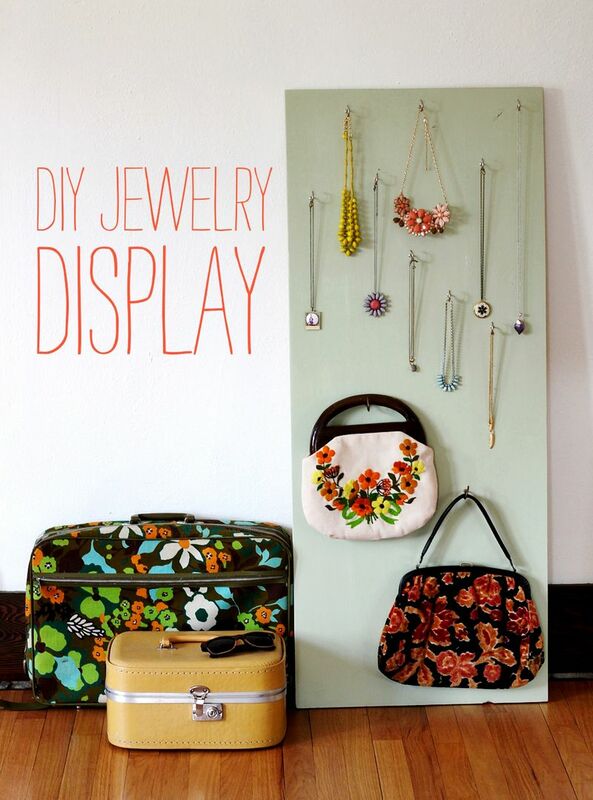 Step 2: Place your panel of wood on the floor and arrange your jewelry as you’d like it to hang. Be sure to space hooks about 2″ apart. Make marks where your screws will go. Step 3: Carefully drill about 1/2″ into the wood. Be sure you don’t drill through. Your board should be pre-sanded but lightly sand it again and wipe it down to be sure your paint sticks easily. Step 4: Paint a layer of white primer on the front and edges of your board and let it dry. Paint two layers of your paint color of choice and then add your screws. The great thing about this is you can change it up as your tastes or space needs change. It’s an inexpensive project that can be knocked out in an afternoon. Those are the best kind, aren’t they?